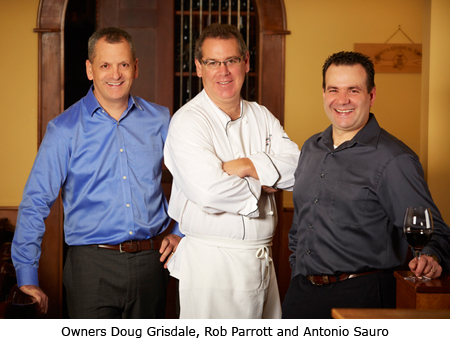 It’s a family affair at West Vancouver’s authentic neighborhood Italian restaurant. Mangia E Bevi Ristorante (translation: Eat and Drink) opened its doors on …April 10, 2007. Born from the desire of owners Antonio Sauro, Rob Parrott and Doug Grisdale to have a neighbourhood gathering place with superb Italian fare, old-world service and a casual, comfortable ambience. Growing up in West Vancouver, North Vancouver and Abbruzzo, Italy, we all enjoyed gathering with family and friends around the table laden with great food. Our philosophy is simple, the food must be good and it must be shared with large groups of people. We want our guests to feel like they are gathered around our family table. Having spent 35 years in the restaurant industry in both Europe and Canada, Antonio believes that celebrating with food and drink in an atmosphere of family, friends and new acquaintances is the most important aspect of a restaurant. Doug grew up just 4 blocks from the restaurant and got his passion for entertaining guests from his mom, who always welcomed everyone who knocked at the door. When the opportunity came to join Antonio (his brother-in-law) in opening an Italian restaurant, he jumped at the chance. His belief that every customer should be treated like family is evident through his passion to ensure that all our clients feel at home. Rob’s gift for menu innovation is evident in Mangia E Bevi Ristorante’s offerings. With over 25 years of experience cooking Italian food, he has taken traditional Italian fare and added his own West Coast touch while still maintaining the intricacies of Italian flavours. Living by the credo that food is better when shared with friends, most evenings you will find Antonio, Rob and Doug ending their day together over a great meal and a glass of wine with plenty of laughter. While great food, wine and service are paramount to the success of Mangia E Bevi, being a part of the community we call home is equally important. Having been touched by cancer in too many ways, Antonio, Rob and Doug wanted to use Mangia E Bevi to support the fight against cancer. To date, we have raised over $300,000 to battle cancer at Lions Gate Hospital, BC Children’s Hospital and BC Cancer Agency. For more information about this important cause, please visit our BACIO page.